Aerial Application in Iowa has never known a simpler solution than with a dedicated helicopter provider. With a diversity of fully qualified pilots, FairLifts schedules world-class aerial application services at affordable rates. Whether you’re looking for frost prevention, mosquito and pest eradication or application of fungicides or seed spray provisions, it’s best done by the sky. Aerial application by helicopter optimizes both time and efficiency, allowing you to concentrate on other prevalent aspects of your business. Afford yourself access to the modern solution with regard to possible chemical application procedures today! Put aerial application solutions in Iowa to work, under clear skies in seasonally mild temperatures. Welcome to the finest that America’s Heartland has to offer, in this staple agricultural state known for its naturally grown exports. Prevalent crops in Iowa include corn, oats, hay and wheat, part of the state’s solid agricultural foundation. Home to attractions that include Maquoketa Caves State Park, Effigy Mounds National Monument and West Okoboji Lake, Iowa allows FairLifts pilots the privilege of operating amid clear aerial conditions. This state provides the ideal climate for Aerial Application in Iowa. Take advantage of a wide array of applicable aerial application services today. No matter your individual preferences or your respective budget, there’s an aerial applications package that can optimally conform to the services your crops require most. All of your crop dusting needs are put into well-qualified hands, when you put your trust in world-class helicopter piloting expertise to satisfy the extent of your aerial application needs. 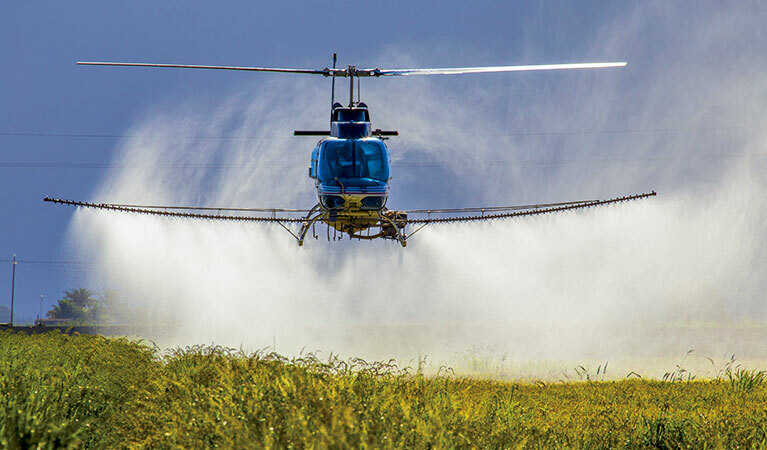 From the application of fungicides and fertilizers, to all watering needs and seed spray applications, the solution to all forms of crop dusting is only a phone call away. You’re free to address pressing agricultural needs, with the knowledge that a provided helicopter can facilitate all application needs. Mosquitos and assorted pests can easily undermine the success of your crops, year-in and year-out. However, with the cutting-edge aerial application services provided at exclusive rates, mosquitos and assorted airborne pests will no longer pose anything of a threat. Effective, simple solutions applied through the air will keep these pests from influencing the success of your crops, for optimal results come harvest-time. Don’t let problems this small prove a roadblock between your crops and their deserved success. Natural inhibitions to your crops include brush and assorted weeds, and when left untreated, they can threaten to impede your crops’ successes. However, effective aerial application packages through professional provider can help put your crops on the fast-track toward sustained success, when you free them from brush and other weeds. Discover what ideal crop performance looks like, when your fields exist free from the adverse influence of brush and weed inhibitors! Even the harshest weather conditions shouldn’t be able to get between your crops and their sustained success. This protection is made easier than ever with the help of a certified helicopter provider, with aerial application packages that provide unrivaled frost prevention and treatments. Once your crops are well-equipped to handle the worst that the elements can send their way, courtesy of proven industrial treatments applied by air, you can consider your fields optimized for a full performance. Protect your crops with the aerial application services they deserve, when you reach a FairLifts customer service agent today. All of your outstanding inquiries will be answered by an industry expert! You can also fill out an online contact form, for a quick reply.